We just want to remind you that those moments when you throw your gym bag in the locker, take a big yawn and grumpily walk to the gym equipment are totally normal. It’s okay to want to kill your personal trainer (sometimes) and it’s 100% okay to want to stay in bed all day eating pizza (the absolute life, right??). It’s hard to realistically believe that our ridged workout routine is going to fulfill what our mind wants 100% of the time. The reality is, every time you pull yourself out of bed on a cold winter morning or make that turn on your way home from work to hit the gym, you’re probably pulling from a list of motivations. We understand, sometimes this list gets dull and boring and flopping on the couch overweighs being healthier when you’re 80 years old. So, in search of motivation, you turn to forever trusting technology to solve yet another problem in a flash – and at first, you’re not disappointed. Although, as you flip through apps and apps, pondering if you should delete some photos on your phone to make space to download them, you get a little overwhelmed. Then, having to delete them because they lag, they have annoying ads and all they really are is some girl in a sports bra talking for 20 minutes before showing any exercises, you’re finally quite annoyed. So, to answer your question of “why is it so hard to find good fitness apps?” we’ve compiled this list of the best apps out there. Abs start in the kitchen, right? Of course – it’s actually more important to maintain your healthy lifestyle than you think. Maintaining a healthy diet is not only going to keep your body fueled with the right nutrients, thus sending vitamins and minerals to your brain increasing brain function and your “happy hormones,” it will also help you actually see your muscles getting toned by keeping off that extra layer of fat. So, it aids in the mindset and results of working out, and all you have to do is eat. Pretty amazing isn’t it? Until you’re actually at the store in the restaurant counting calories, food groups, macros, micros, etc….. here’s 3 apps to help with that. This tools simply counts calories and helps with your daily food intake. You can set goals coordinated with your workout regime, which can help you maintain a calorie deficit of you are wanting to shred pounds fast, or keep it in check, so you’re not gaining weight. The data of the app contains even brands and resurtants menus to help you make the most targeted decisions, in addition to staying on task, even when the going gets hard. The app uses gamification badges and challenges to loyal users. Have you always wanted a nutritional coach but never really wanted to go through the whole process of hiring one? This app is for you. You can log your meals and workouts on this app. Your information is used to tailor positive encouragement combined with factual articles and healthy recipes to keep you going through your busy days. It is a combination of nutritional coach and a pedometer. It’s free and is available for iOS and Android devices. This app is exactly how it sounds. It provides healthy alternatives at your regular spots. It’s very specialized in the sense that you can input all your dietary needs, such as allergies, sensitivities or simply things that you just don’t like. The apps suggest modifications to the recipes according to the specific nutritional needs of the user. It is a free app that can be downloaded on iOS and Android devices. Getting fit can sometimes be even an extra challenge if you’re in it alone. And, more often than not, this is usually the case. That’s why Cody was designed. It’s basically an app like Facebook but for fitness. It exposes you to a community sharing their workouts and fitness ideas. You’ll be able to make friends based off their fitness routines and you can easily follow them. You can even make your own routines and have a community following you. This is great for aspiring fitness instructors or if you just want to share your favourite routines. Everyone has the ability to track their individual progress and encourage eachother! This free app is available for iOS devices. We are human after all, and that’s exactly what this app is trying to prove. It’s designed to make sure you get your 30 minutes of exercise, no matter what type you do. For example, if you took the stairs, walked across the city, ran after your toddler and carried a huge load of groceries, this could count as your 30 minutes. The next day you may attend a dance class – this also counts. The app tracks your movements and lets you set goals to make sure you’re still staying on target – but in a more suitable way for everyday life. Available for iOS devices. What is a good workout without a good sleep? This app tracks your sleep cycles to ensure you’re getting a consistent goods night rest. You can choose your preferred wakeup time and if you wake up beforehand, then you will be able to fall back asleep easily thanks to the soothing sounds of this app. The micro-phone picks up the moments via sound vibration analysis, therefore giving you a great analysis of your states of sleep. This analysis pinpoints the optimal time to wake up within a 30-minute window. Available for free on both iOS and Android. Imagine having the best personal trainers lead you for free? That’s basically what this app is. The step-by-step exercises are common, but super effective. Since experienced trainers are contributing to this app, the workouts are extremely targeted. If you want to target your abs for bikini season, they offer 5-minute workouts or a 45-minute cycles. The interface is user-friendly and offers a free trial. Are you into bodyweight exercises? Maybe you travel often, or you don’t have access to a gym. 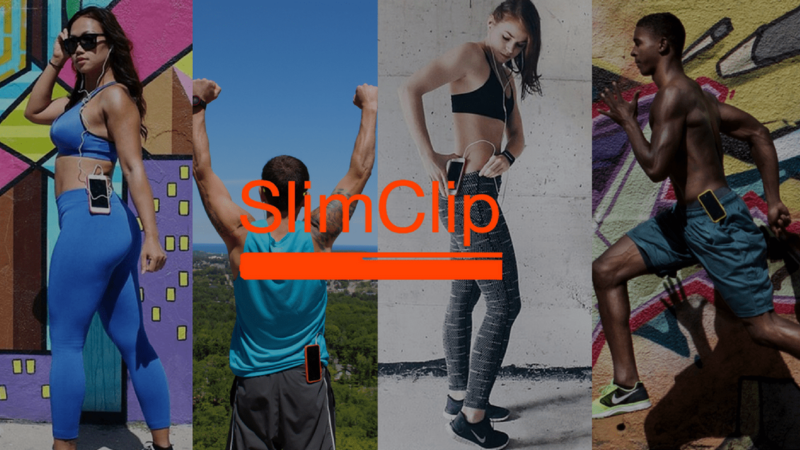 This app is the app for you if you’re trying to target a specific area, without any fancy gym equipment or hard routines. It offers the option to let you sync your own music, in addition to selecting workouts based on your specific goals. Talk about personalize training. So, you probably have one more question now that you’re fully motivated to workout – how exactly do you use these apps if your hands are busy actually doing your workout? To answer you question, we’ve developed the thinnest clip case in the world. For your convivence, focus and usability, SlimClip Case was made.